With Office 365, Microsoft‘s online portal of products, a few new programs have been quietly introduced. One such program is Sway. In exploring this PowerPoint alternative, it becomes abundantly clear how the possibilities for its application are quite limitless. So what exactly is Sway? Sway would be best described as a cross between a PowerPoint and a streamlined website. It organizes information into “cards” which are similar to PowerPoint’s slides. These cards, however, can be used to show text, images, embedded information, videos, maps, and a multitude of other features. A screenshot of Sway in action courtesy of the Microsoft Office blog. How can Sway be used? In looking at Microsoft’s quirky tutorial series on Sway, one finds out that Sway is intended to be a presentation tool. This November 2014 article by Business Insider suggests that Sway could eventually replace PowerPoint, but with the addition of the “Mix” extension to PowerPoint, it does not seem as though that is in Microsoft’s plan at this point in time. In their tutorial series, they suggest using Sway to collect information on the weather, images from a vacation, or even to create a newsletter. In education, this means that we can take these suggestions a few steps further to enhance the classroom experience. a Smart Board/E-Beam/Promethean Board center. During centers day, the interactive whiteboard could be its own interactive station where students can explore the content. This could draw students of all ages into the content by having them interact with maps, videos, images, and documents embedded into the Sway presentation. an interactive newsletter to email to parents. Embed the PowerPoints from the week, pictures of students hard at work, and include PDF files of the required assignments. The Sway newsletter could, in this case, be used to help students who have been absent by providing a collection of the week’s lesson materials. It can also serve to keep parents informed of what content has been shared in class. an interactive activity for a BYOD (Bring Your Own Device) lesson. The inclusion of videos, images, and documents will provide students with background information on a topic. Social Studies and English teachers can make a Sway to create an interactive DBQ (document based question)/LBQ (literature based question) prompt. Teachers of all grade levels could use a Sway presentation as an interactive lesson overview for previewing or reviewing purposes. a presentation of student growth per unit or per school year. A Sway presentation could be made to showcase data in an interactive format. With end-of-the-year teacher evaluations, one could include charts, graphs, or spreadsheets with this information. How could Sway be used within the halls of your school? Office 365 offers untold treasures beyond cloud storage for documents and spreadsheets. In fact, with it and updating to Office 2013, there are many new programs, and program extensions that have great utility in schools. Office Mix is an extension to PowerPoint which means that once downloaded, it adds enhanced features to your existing PowerPoint program. With Mix, which is represented by a button on the “ribbon” or toolbar at the top, you can add a variety of items to PowerPoint. include interactive questions, quizzes, or polls. Mix includes its own version of an app store with the interactive features you can embed into your PowerPoint. Once Microsoft adds more to the current offerings, this program will certainly prove even more useful than it already can be. How can it be used to enhance your lessons? create alternative presentations (for student projects, or teachers). Once again, the possibilities are seemingly endless. 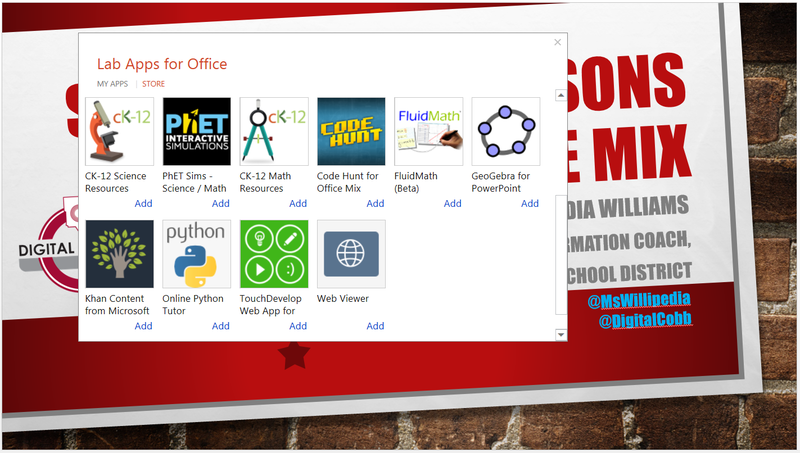 How do you see yourself using Office Mix in your classroom? Originally posted on my team’s blog.